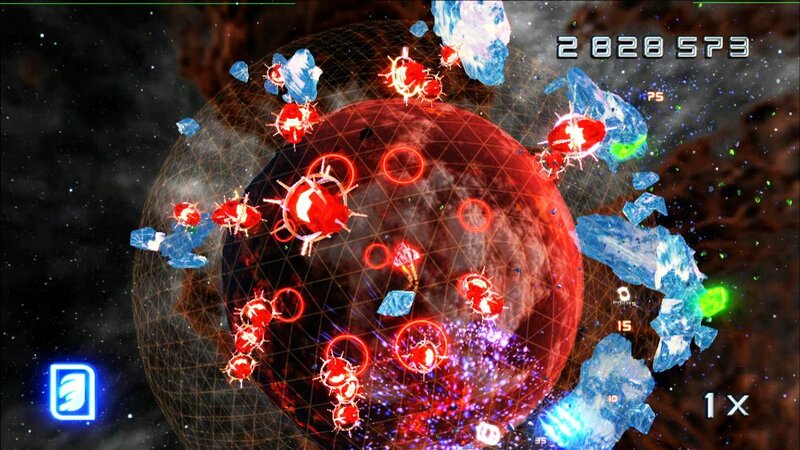 While I was playing Super Stardust HD, there was one thing that I kept saying to myself: “this just isn’t as fun as Geometry Wars”. The game definitely adds a new twist to the idea but is it sad when all I want to do is get to the end as fast as I can so that I can move on to the next game? Yes SSD HD is a highly addicting game and you will lose yourself in it pretty quickly but until now I couldn’t put my finger on it. The problem with this game is that it is overly repetitive in every aspect. See something similar every single time? Rocks, gold nuggets, ice. The main focus is to destroy the big chunks to discover power-ups to upgrade your weapons. Once they are upgraded you can do more damage. I will admit this was a lot of fun the first two worlds but once it became a game based solely on destroying these chunks and less about bosses and things coming to attack you, I instantly got bored. Don’t get me wrong, there are enemies and big boss fights but in later levels the bosses are the same with just more of them instead of putting new ones in. In my opinion that is laziness but I guess it can be fun to some people. I thoroughly enjoyed the controls in this game because they were very responsive and easy to remember. There isn’t a whole lot you can do in a game like this but it seems everything was there for a reason. It is unfortunate that the music is forgettable because it really could have enhanced the game a lot more and immersed me in the levels. The visuals are amazing and it is definitely one of the few things that kept me playing through the entire thing. The explosions are pretty and the weapons flow very nicely. The chunks explode in amazing detail and you can’t help but stare at it for a little while. 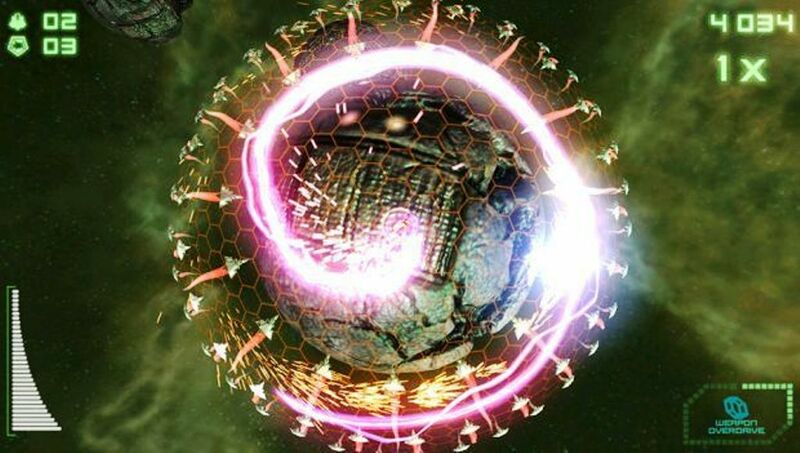 Now why did I make a comparison to Geometry Wars at the beginning of this review? Well because this game is just that but instead of in a rectangle box, you are floating around a sphere. SSD HD does have a coop mode but its forgettable because so many things are happening on the screen at once that it just becomes a game of “which one am I again?”. 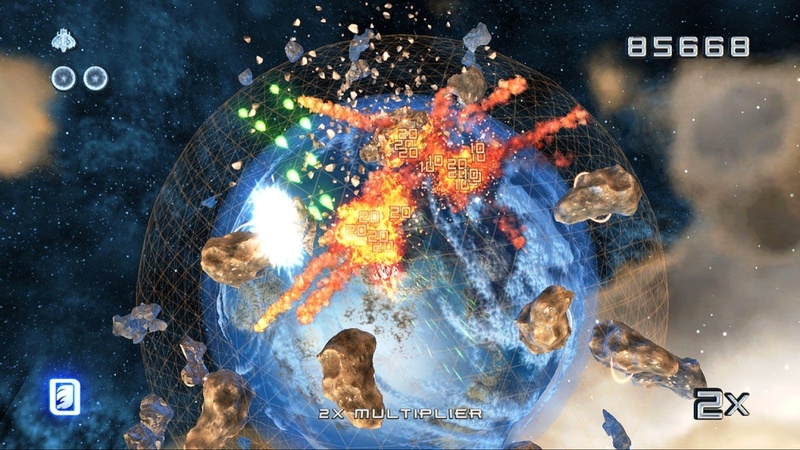 Geometry Wars created unique types of levels for multiplayer and allowed you to try and do better than your friend. It became a game of scoring points and playing to see how you could get those points easier. SSD HD has a points system but your focus is less on that and more on getting to the end of the level and defeating the boss. I’m not saying this is a bad game at all because it is definitely worth the download but it does not hold up to other games of the same type. It is a very repetitive game but a very beautiful one at that.